Hmiss is a salad made with long green peppers, garlic, and tomatoes. This one is related to the city of Bejaia (east coast of Algeria) and this recipe is from my mother. 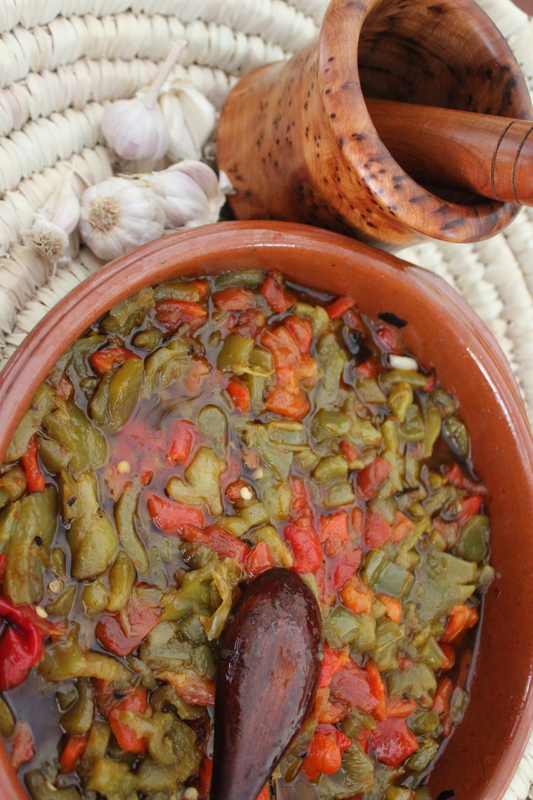 This dish is very popular in summer when the green peppers are everywhere on the market. Grilled your green peppers, the chili pepper and the ripe tomatoes on a grill pan (at medium heat). It’s much better on a BBQ with charcoal, however, a grill pan works just fine! When all the vegetables are grilled and the skin turns black, remove from the heat and put them on a plate and allow to cool for 10 minutes. Now start to remove the skin of your vegetables with your hands or with a knife (this is the difficult part because the skin sticks to your fingers). Rinse your hands with the water and repeat again, don’t rinse your peppers as you will loose the taste of them. Remove the seeds from the peppers and from the tomatoes. Cut all the vegetables and garlic into small pieces. Put olive oil in a pan (2 tablespoons ) and add the peppers, the tomatoes, the garlic and the salt. Cook on a medium heat for 15 minutes, when the salad is cooked removed from the heat. Serve on a big plate and drizzle with a little bit of olive oil.It’s good when it’s cold too. This salad is very good with any bread to eat.